Port Hardy is located at the north end of scenic Vancouver Island with a harbour that offers year-round shelter. Hardy Bay is close to scenic coastal cruising, superb fishing and is the start of the beautiful Inside Passage to Prince Rupert. In fact, Port Hardy serves as the transportation hub for the busy Central Coast. Port Hardy is home to several Municipal wharf systems, as well as a private marina and a water-front recreation site at Bear Cove. These wharf systems are a short walk from the downtown core and a wide range of amenities. In the summer months, harbour staff monitor Channel 66A, latitude: 50º 42′ 0″ and longitude: 127º 25′ 0″. Port Hardy is home to the southern terminus for BC Ferries Inside Passage and Prince Rupert routes. 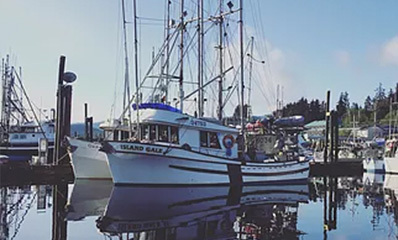 In the busy summer months, the Ferry also offers the immensely popular Discovery Route sailings, providing guests with a scenic loop tour to the Mid Coast communities and villages, including Bella Bella, Klemtu, Shearwater and Bella Coola. There is a regional airport with daily scheduled flights to Vancouver to the south and to the Mid Coast; there is a scheduled bus that leaves every morning and arrives every evening with a modern highway (Highway19) connecting Port Hardy to southern parts of the Island. View our local Wharfs and Floats.